Home / Automotive / News / Tesla Factory Tour With Elon Musk – How Exciting! When talking cars and trucks, I think that many people will agree that some of the most advanced automobiles these days come straight out of Elon Musk's Tesla factory. It seems like the detail-oriented company that Tesla is has their eye on just about everything in their production process and, with the help of a magnifying glass and watchful eye, try to bring everything about the automobile into the future the best way that they can possibly do it. Therefore, it would lead you to believe that the factories behind these cars are just as advanced as the automobiles themselves with the thought process of propelling everything forward. As you can probably imagine, with as busy as Elon Musk tends to be as he pioneers plenty of projects – from energy to space travel and everything in between, grabbing a minute of his time can be difficult. 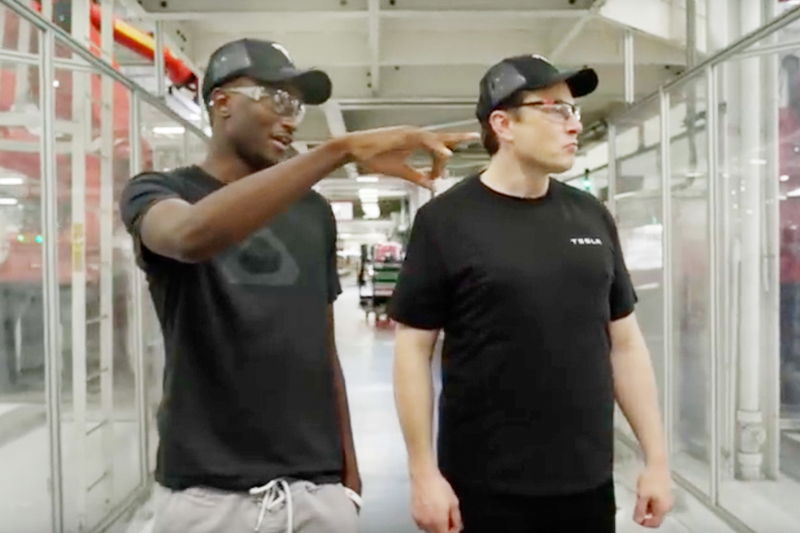 Fortunately, thanks to the Marques Brownlee YouTube channel, we get to take a tour of one of the Tesla factories with the man himself. This is definitely an exciting endeavour as it gives us the opportunity to peek behind the curtain of some of the most awe-inspiring vehicles that you will see on the road these days. In the video below, we get an in-depth rundown of some of the processes that create these vehicles that seem to be miles beyond much of the competition in the tech realm. It really seems like with each and every process, Musk is really dialled in and cares about making every last millisecond count. When you’re producing Tesla's on that high a level, the savings of a couple of seconds and multiplied to thousands of cars could mean millions of dollars in the bank, and seeing how those savings happen is something that everyone should see! How Does The Tesla Model 3 Work Without A Key Or A Fob? Video: The Tesla Semi Approaches! Tesla Model S & Model X With Updated Features... And A Drag Race! Video: Tesla's Model 3 Is Unveiled With A Surprise 500km Range! Video: Elon Musk's Fight With Jeremy Clarkson After Tesla Vs. Top Gear War!